Walk instead of going back to bed after I finish my morning coffee. 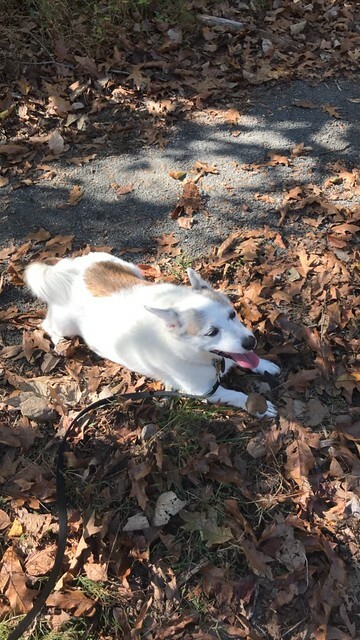 Done for today – I took Lil for a walk on the W&OD trail (a rail trail) that runs through my neighborhood and all the way into DC. Done. Lil and I have walked every day since last Monday. Somedays have just been around the block, and twice so long that I broke her and had to carry her part of the way back; I won’t do that this week, I’ve promised her. Carry on knitting (S)urge, the new shawl and read The Essex Serpent while doing it. Done. I finished The Essex Serpent (5 stars, would read again) and started Brazzaville Beach. 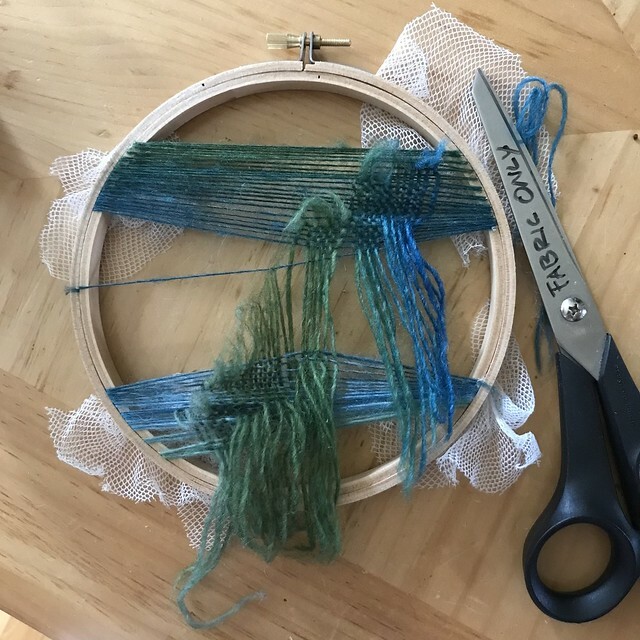 Start a new embroidery or new spinning project. Started, made progress, and ruined. But I have a similar, better idea for the next one. Ruined! I should have made my peace with the netting. Write a post about Spinzilla. Nope. 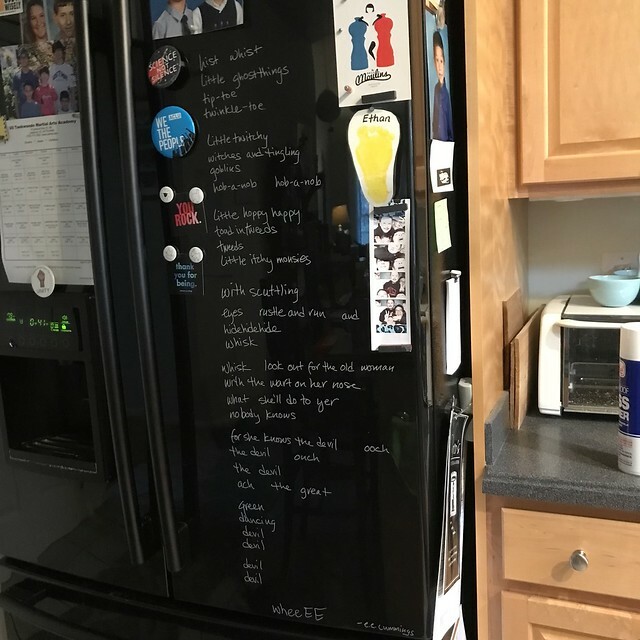 But I did change the poem on my refrigerator to e. e. cummings [hist whist]. And, unexpectedly, I found the perfect kitten while browsing Petfinder, which replaced my Twitter feed for a while. I convinced my husband, with some wise words from my 13 year old who said “Dad, just give in; you can’t win an argument with Mom!” and I filled out the adoption application for this guy, who’s current name is Spider. Double paws, black fluffy coat, and a blep? I’m in love! Carry on with walking every day, but not so much that I break Lil and have to carry her. Carry on knitting (S)urge, the new shawl and read Brazzaville Beach while doing it. Start another new embroidery project using lessons learned from the scissor catastrophe. Spinzilla. I’m going to write about it as soon as I post this. Spider-kitten: wait patiently. My contact at the rescue is out of town until Wednesday. Saturday we’re going to Morgantown for my oldest’s birthday. I think there will be hiking and cake. And lots of car knitting. LOOK AT BABY KITTY!!!!! Omg what a good choice! Your poor broken dog is super cute too! Nice to have a walking companion. Yes, having a walking companion helps! The kitty is super cute and I really hope he ends up here with us. Time will tell! I hope so too! He looks like such a sweet heart! Aww…I hope you get the little kitty! He is super adorable 🙂 I miss having cats; however do not miss cleaning the litter box. Maybe one day…however my hubby is allergic to them and put up with my two for years before they both passed on. 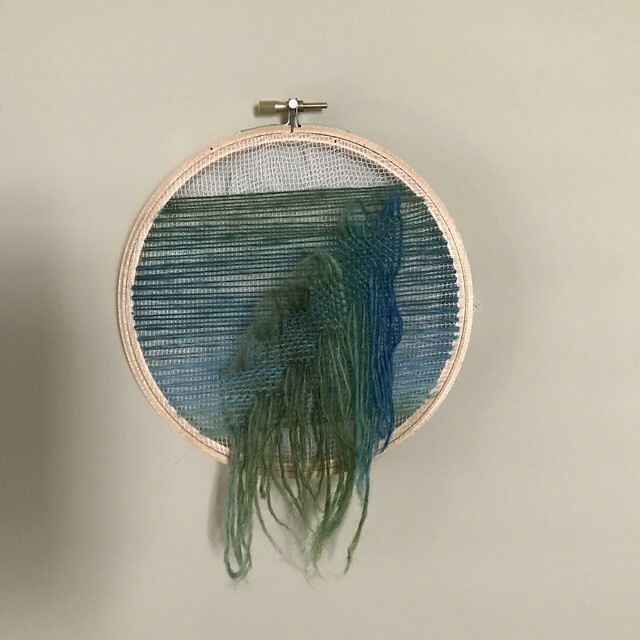 I saw your pic of the embroidery project on IG and about cried for you. I love that we can learn from our past and make things better for the future. The cat box isn’t as bad as scooping the dog poop up from the back yard; at least I know everything is in one spot (the cat box) and once it’s clean, I’m done. The dogs can be creative sometimes. And yes, I can’t believe I did that but now I know what not to do next time!